With 4th of July and other summer celebrations around the corner, I thought it would be a good time for a little tutorial on how to photograph fireworks. 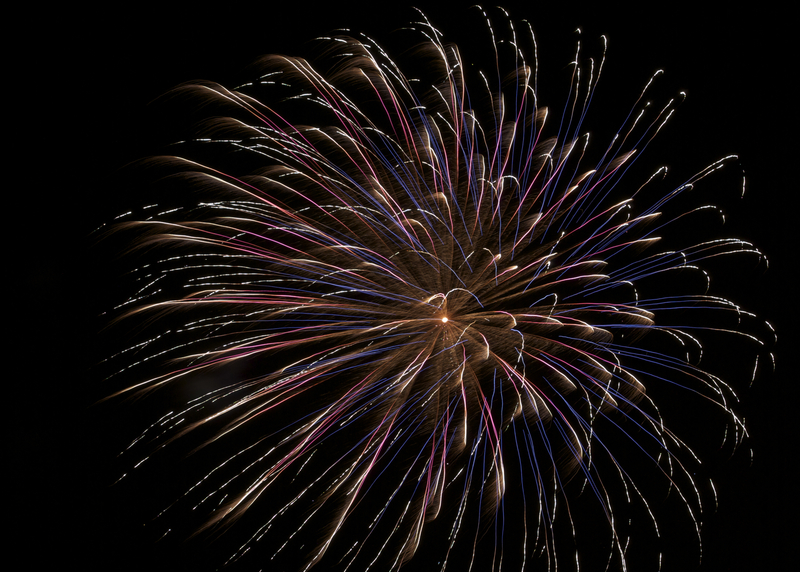 Last year, I watched a two-hour Creative Live class with John Cornicello that went over pretty much everything you need to know to photograph a fireworks display. This tutorial is basically a summary of his information with a bit of my own experience thrown in and a few of my photos from last 4th of July . . . Check out the location you’ll be shooting from before it gets dark so you’ll know if there will be any obstructions and then pick your spot accordingly… Will you be watching the display from an awesome location (like fireworks over the water or a bridge or some local hot spot and you want to capture some of that context along with the fireworks) Or will you be watching nearby fireworks from your driveway like I was last year and just want to isolate them in the sky? What could be in your shot that you don’t want to see? (telephone poles or wires, trees you don’t want to see, tops of insignificant buildings . . . ) What could be there that you might want to pick up along with the display to give some context? (crowds watching the show, easily identifiable buildings or landmarks/monuments) check out your location before it gets too dark and figure out where you’ll shoot from and the best place for you to stand; if possible set up your tripod and leave it there. 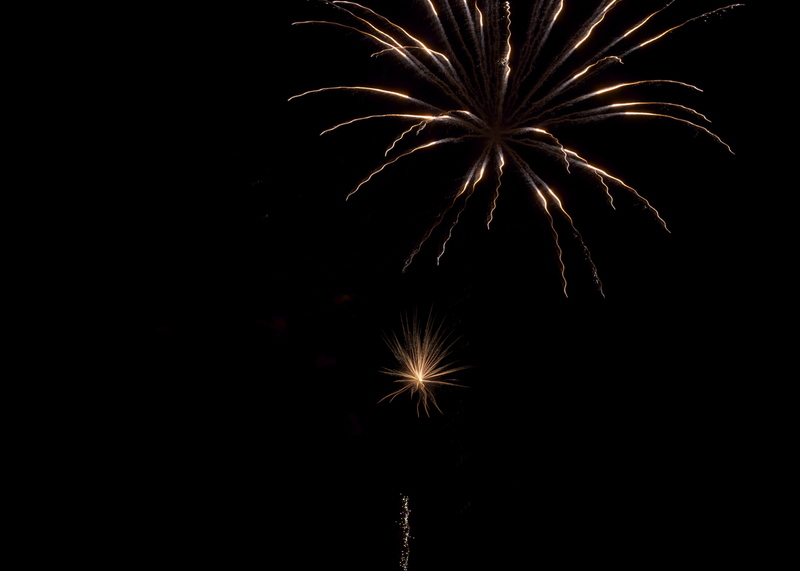 Use a low ISO (fireworks are bright and do not need a high ISO to be photographed beautifully!) 100 or 200 ISO should be just fine. 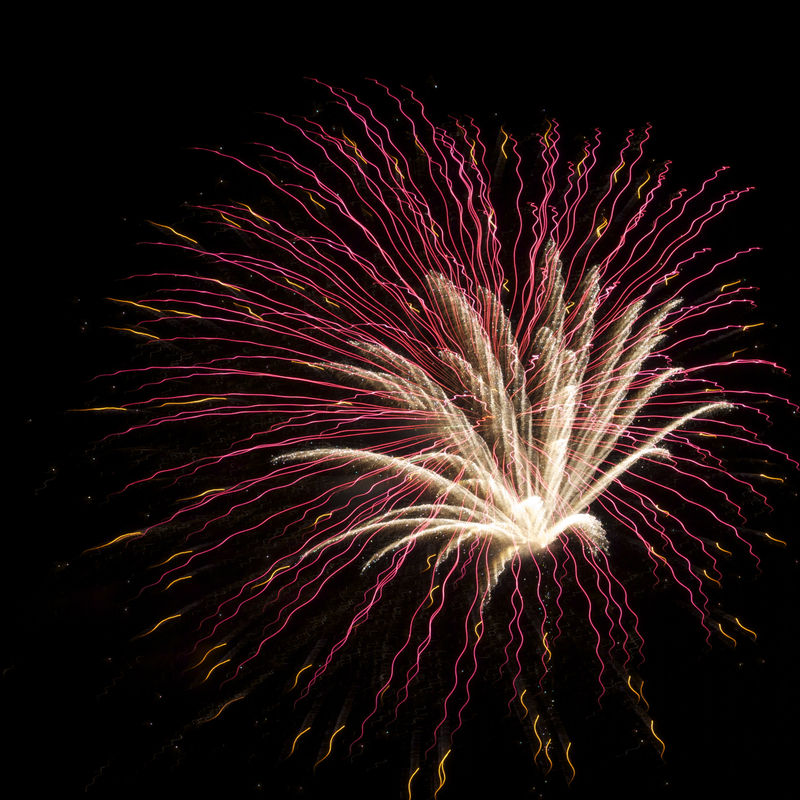 Shutter speed: say it with me: “fireworks are bright!” and easy to over expose so you don’t need a super-long exposure. 1 to 2 seconds will work, but that said — feel free to experiment with longer and shorter shutter speeds and see what you get. I’ll say that last part again because I think it might be the most important and the most fun: EXPERIMENT! that’s how you get fun and unique shots. Take a few “perfect” shots and then play around and see what happens! No need for flash. IF you maybe want to capture a hint of someone watching the fireworks, MAYBE use a low flash, but otherwise, just forget about flash — one less thing to worry about anyway. Manual focus: Use the first few shots to see where the fireworks will be in the sky and figure out your focus and then lock it in if you can. If I remember correctly, I was able to set my focus to infinity and it was just fine for all of the shots, but I was also only photographing the fireworks and no context so your situation might be different. Take your wider images first … with fireworks comes smoke and especially if it’s a bit windy that smoke can really cloud up your shot so take the wider shots/shots with more context early on in the show. Camera Phone or Point and Shoot? Most of this still applies and you can still get some fun shots. Though you may not be able to choose your aperture and shutter speed, you still need a steady surface (love the gorillapod for point and shoots) and should not use your flash. Scouting the location ahead of time will be even more important because you’ll have a wider shot. No matter what tool you’ll be using to capture your next fireworks display, take lots of shots, try new things, and most importantly HAVE FUN! Thank you for sharing this information. I am so excited to try this out next week. I will most defineitly referance this post on my blog when my photo come out. Thanks again! Hi Kevin! Thanks so much for your comment. I can’t wait to see your firework photos!! I’m gonna take some too! Thanks Rachel. Awesome! Come back and let us know how it went!